An out-of-the-ordinary, simple, blue and white fractal suggesting a melt water lake and a river, or stream, in a valley between glacier-covered mountains. This image is rather odd looking, but strangely appealing, a fortuitous randomly-generated fractal. I doctored it a bit to enhance the appearance of ice and snow. This is a follow-on to the most recent post. Alaska already has one Copper River; it does not need another. Here’s a Pebble Mine Penny made from copper to be taken from the mine. 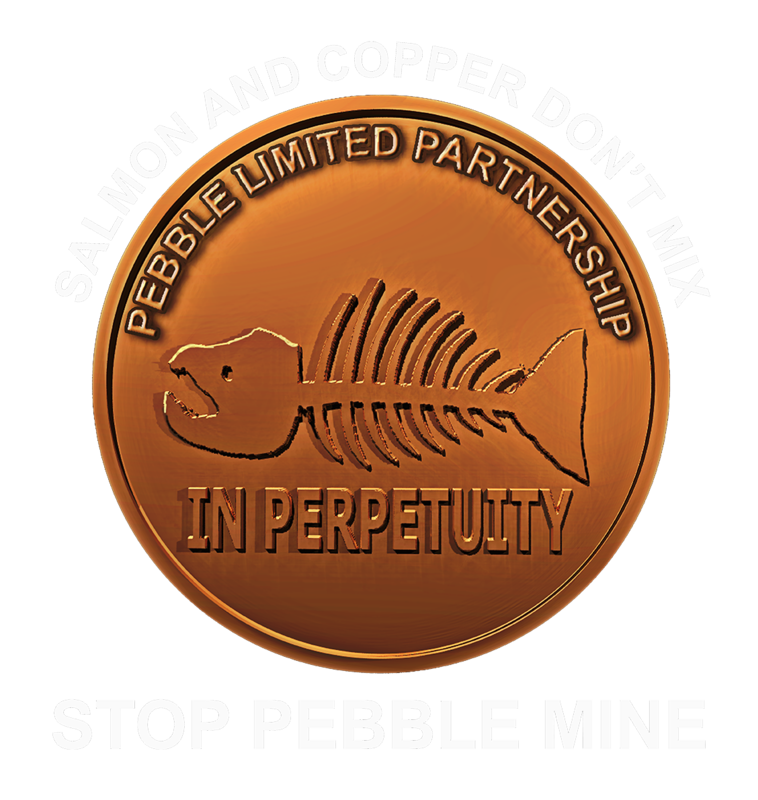 As copper leaching from mine tailings will seriously impact salmon spawning grounds the coin features a fish skeleton. It also features text reading “IN PERPETUITY” (forever), which even the mine developers admit is how long the tailings pile will remain dangerous. And when the Salmon are gone that will be in perpetuity as well. A penny for your thoughts. Write the EPA and ask them to disapprove the Pebble Mine. As with the earlier Pebble Mine graphic I will donate a hefty percentage of any proceeds from the sale of items bearing this image to organizations fighting Pebble Mine. The more items sold the greater percentage I will donate. 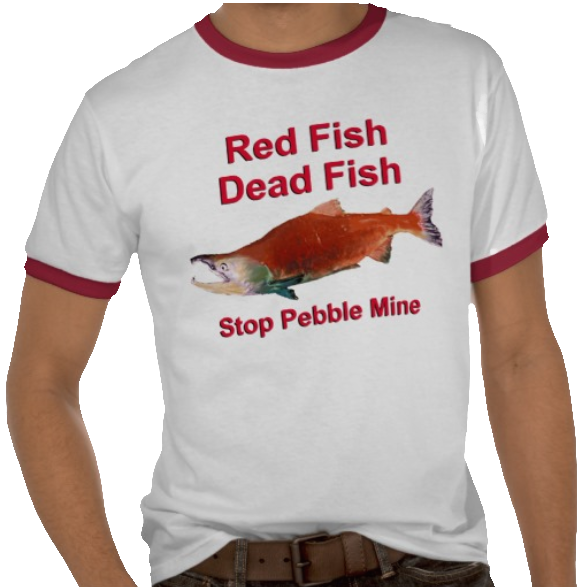 Search “Stop Pebble Mine” at my Zazzle store. After the Salmon are gone what will we eat? A depiction of a Sockeye Salmon in its red spawning phase. Miners want access to a very large deposit of gold, copper and molybdemum, located in the headwaters of the Kvichak and Nushagak Rivers, two of the eight major rivers that feed Alaska’s Bristol Bay. Bristol Bay is home to one of the world’s few and most productive wild salmon strongholds that supports a $500 million commercial and sport fishery. Plans for the mine include the world’s largest earthen dam to be built, some 700 feet high and several miles in length. Independent scientists have questioned whether the dam could withstand the force of a massive earthquake, such as the 9.2 quake that devastated Anchorage in 1964. The dam and 10-square-mile-wide containment pond are intended to hold between 2.5 billion and 10 billion tons of mine waste that Pebble would produce over its lifetime – nearly enough to bury Seattle, Washington. Mine tailings would include sulfides, which become sulfuric acid, as well as copper. The area around the mine is a spawning ground for salmon. Salmon are highly sensitive to pollution, especially copper. If salmon are exposed to even miniscule amounts of copper (parts per billion), their sense of smell is interfered and impairs their ability to locate spawning grounds and identify predators. By the consortium’s own admission the earthen dam will need to be maintained in perpetuity (i.e. forever) in order to ensure acid-generating tailings do not damage the environment. Activity at the mine will last for approximately thirty years until the ores are exhausted. And, we are supposed to believe that the consortium will still be around ten thousand years from now protecting the environment; or maybe just one thousand years from now, or even fifty years from now. Forever is a long time. After the mine is played out the consortium will be gone leaving an inevitable catastrophe in its wake. In addition, the mine is to be sited in an active geological zone, but we are told the fault line miraculously goes around the site and poses no threat. The consortium, the Pebble Limited Partnership (PLP), includes the world’s second largest multinational mining corporation, London-based Anglo American, along with Northern Dynasty, a junior mining company headquartered in Canada. Anglo American’s environmental track record does not bode well for Bristol Bay and Northern Dynasty has little experience safeguarding the environment having never developed a mine to date. Nevada – Anglo American is responsible for the largest source of mercury air pollution in United States history. Recommendations to limit fish consumption have been issued for downwind fisheries. Ireland – Lead and zinc contaminated river sediments and sections of the river were closed to anglers. Over 220 mine workers have died at Anglo American mining operations in the last five years. 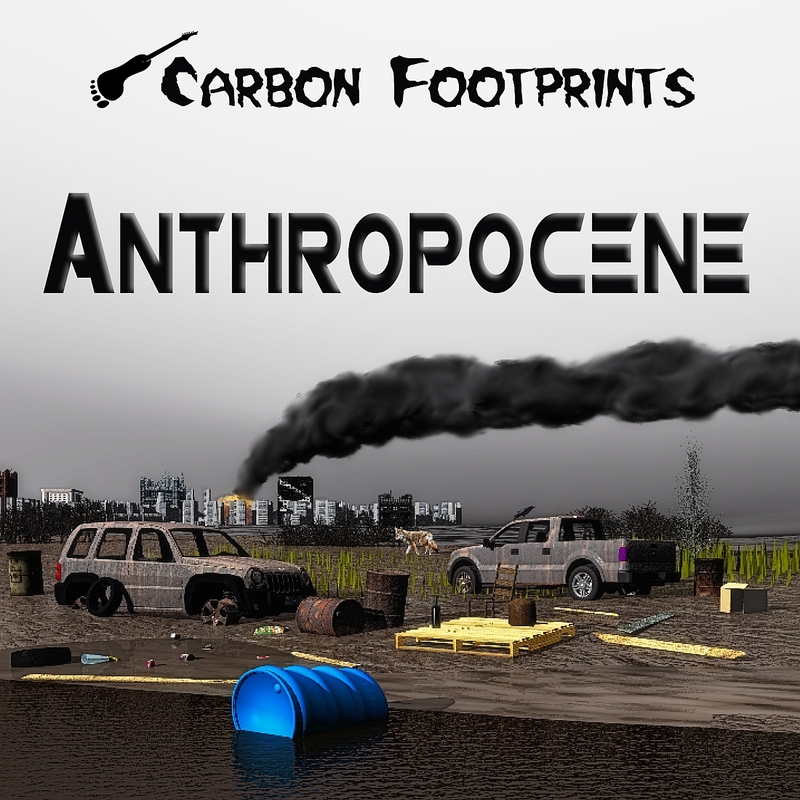 The designation Anthropocene” would serve to mark the evidence and extent of human activities that have had a significant global impact on the Earth’s ecosystems. Crutzen regards the influence of human behavior on the Earth’s atmosphere in recent centuries as so significant as to constitute a new geological epoch. To date, the term has not been adopted as part of the official nomenclature of the geological field of study. In 2008 a proposal was presented to the Stratigraphy Commission of the Geological Society of London to make the Anthropocene a formal unit of geological epoch divisions. A large majority of that Stratigraphy Commission decided the proposal had merit and should therefore be examined further. Steps are being taken by independent working groups of scientists from various geological societies to determine whether the Anthropocene will be formally accepted into the Geological Time Scale. Many species have gone extinct due to human impact. Most experts agree that human beings have accelerated the rate of species extinction, although the exact rate is controversial, perhaps 100 to 1000 times the normal background rate of extinction. In 2010 a study published in Nature found that “marine phytoplankton — the vast range of tiny algae species accounting for roughly half of Earth’s total photosynthetic biomass – have declined substantially in the world’s oceans over the past century. Since 1950 alone, algal biomass decreased by around 40%, probably in response to ocean warming – and the decline has gathered pace in recent years. Some authors have postulated that without human impacts the biodiversity of this planet would continue to grow at an exponential rate. The implications being that climate change is accelerating due to, or exacerbated by, human activities. One suspected geological symptom resulting from human activity is increasing leves of carbon dioxide (CO2) in the atmosphere. During glacial-interglacial cycles of the past million years, natural processes have varied CO2 by approximately 100 parts per million (ppm) (from 180 ppm to 280 ppm). At the onset of the Industrial Age atmospheric concentration of CO2 was approximately 280 ppm. Recently CO2 levels monitored at the Mauna Loa Observatory in Hawaii reached 400 ppm. This signal in the Earth’s climate system is especially significant because it is occurring much faster, and to an enormously greater extent, than previous, similar changes. Most of this increase is due to the burning of fossil fuels. Smaller fractions are the result of cement production and land-use changes such as deforestation. The Anthropocene has no precise start date, but based on atmospheric evidence may be considered to start with the Industrial Revolution (late eighteenth century). Other scientists link the new term to earlier events, such as the rise of agriculture and the Neolithic Revolution (around 12,000 years ago). Evidence of relative human impact such as the growing human influence on land use, ecosystems, biodiversity, and species extinction is controversial; some scientists believe the human impact has significantly changed (or halted) the growth of biodiversity. Those arguing for earlier dates posit that the proposed Anthropocene may have begun as early as 14,000 to 15,000 years ago, based on lithospheric evidence; this has led other scientists to suggest that the Anthropocene began many thousand years ago; this would be closely synchronous with the current term, Holocene. 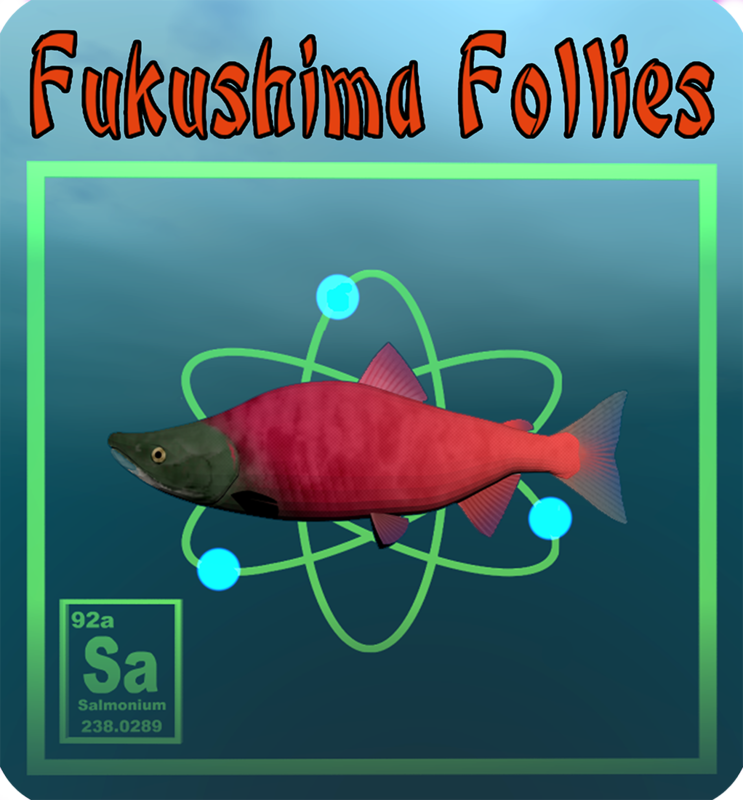 A Sockeye Salmon superimposed on a nuclear symbol and the entry from the Periodic Table of Elements for new element Salmonium-238. 6-7 of every salmon will be fissionable isotope Salmonium-235. Be careful what you eat. Salted Salmonium-238, as LOX, can serve as a substitute fuel in reactors normally burning MOX fuels. 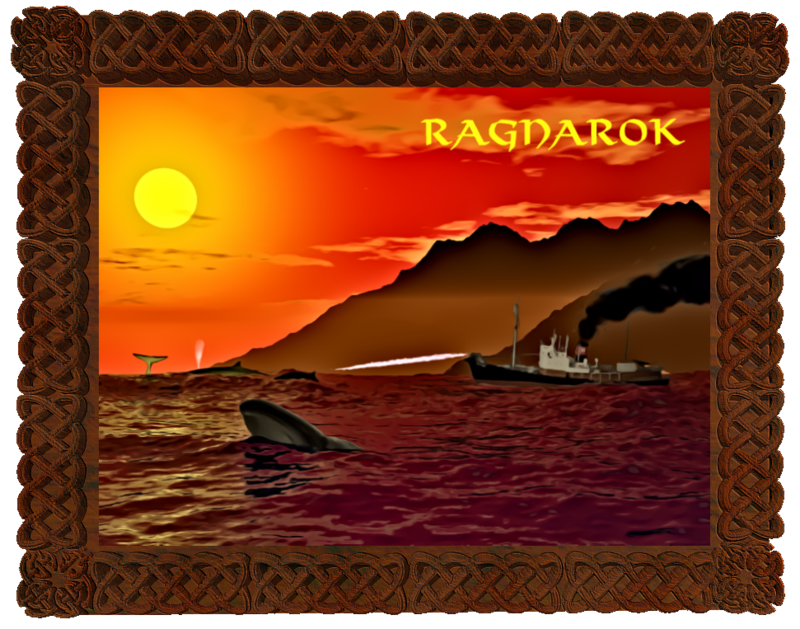 As usual this image is available at my Zazzle store. The situation at Japan’s damaged Fukushima Daiichi nuclear reactor complex becomes worse by he day. Contaminated water is leaking, has been leaking since soon after the initial accident; and in very large quantities. The Japanese government and TEPCO (Tokyo Electric Power Corp) have endeavored to minimize the gravity of the situation, but have made a series of recent admissions, each worse than before, about just how bad things are, and might become. Even with that some nuclear experts believe the leaks at Fukushima are much worse than the authorities have stated. The chairman of Japan’s nuclear authority, Shunichi Tanaka, stated at a press conference that he fears there will be further leaks, “We should assume that what has happened once could happen again, and prepare for more. We are in a situation where there is no time to waste,” he told reporters. And there are no accurate figures for radiation levels. The ongoing problems at the Fukushima plant increased in recent days when the Tokyo Electric Power Company (Tepco) admitted that around 300 tonnes of highly radioactive water had leaked from a storage tank on the site. This is in addition to the 600 tons (about 150,000 gallons) of contaminated water that leaks on a daily basis. The daily leaks may be larger than admitted as until just a few days ago we were told that only 300 tons leaked daily. The Japanese nuclear energy watchdog raised the incident level from one to three on the seven-step international scale that measures the severity of atomic accidents. This was an acknowledgement that the power station was in its greatest crisis since the reactors melted down after the tsunami in 2011. Water from the storage tanks has seeped into the groundwater and then into the sea. Efforts to use a chemical barrier to prevent sea contamination have not worked. TEPCO has considered a plan to freeze soil around the site in order to stop, or at least slow, the leaks. Storage problems are compounded by the ingress of ground water, running down from the surrounding hills. It mixes with radioactive water leaking out of the basements of the reactors and then some of it leaches into the sea, despite the best efforts of TEPCO to stem the flow. Some of the radioactive elements like caesium that are contained in the water can be filtered by the earth. Others are managing to get through and this worries watching experts. Currently, the biggest concern is the possibility that other isotopes, such as Strontium 90, which tend to be more mobile, get into the groundwater. The isotopes will eventually end up in the ocean and accumulate in seafood. There are also worries about the spent nuclear fuel rods that are being cooled and stored in water pools on site. These contain far more radioactive Caesium than was emitted during the explosion at Chernobyl. Not only the Japanese are at risk. 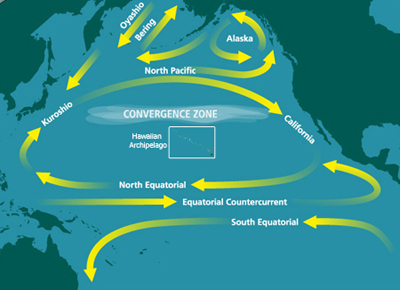 Radiation from Fukushima is coming to the west coast of North America via an ocean current called the North Pacific Gyre. After 10 years the concentrations become nearly homogeneous over the whole Pacific, with higher values in the east, extending along the North American coast with a maximum off Baja California. But wait, there’s more. Soon, an attempt will be made to extract over 1,300 fuel rods (400 tons worth) from damaged Reactor No. 4. A mistake could result in a series of cascading failures and a release of fallout. The removal must be done manually from the top story of the damaged building in the radiation-contaminated environment. In the worst-case scenario, a mishandled rod may go critical, resulting in an above-ground meltdown releasing radioactive fallout with no way to stop it. Fuel rod are removed on a daily basis at the more than 430 nuclear sites around the world, a very delicate procedure even under the best of circumstances. What makes fuel removal at Fukushima so dangerous and complex is that it will be attempted on a fuel pool whose integrity has been severely compromised. However, it must be attempted as Reactor 4 has the most significant problems structurally, and this pool is on the top floor of the building. – The racks inside the pool that contain this fuel were damaged by the explosion in the early days of the accident. – Zirconium cladding which encased the rods burned when water levels dropped, but to what extent the rods have been damaged is not known, and probably won’t be until removal is attempted. – Saltwater cooling has caused corrosion of the pool walls, and probably the fuel rods and racks. – The building is sinking. – The cranes that normally lift the fuel were destroyed. – Computer-guided removal will not be possible; everything will have to be done manually. – TEPCO cannot attempt this process without humans, which will manage this enormous task while being bombarded with radiation during the extraction and casking. – The process of removing each rod will have to be repeated over 1,300 times without incident. – Moving damaged nuclear fuel under such complex conditions could result in a criticality if the rods come into close proximity to one another, which would then set off a chain reaction that cannot be stopped. There are three 100-ton melted fuel blobs underground at Fukushima, but where exactly they are located, no one knows. Whatever ‘barriers’ TEPCO has put in place so far have failed. Efforts to decontaminate radioactive water have failed. Robots have failed. Camera equipment and temperature gauges…failed. Decontamination of surrounding cities has failed. Endless releases into the Pacific Ocean that will be ongoing for not only our lifetimes, but our children’s’ lifetimes. We have 40 million people living in the Tokyo area nearby. We have continued releases from the underground corium (lava-like molten mixture of portions of a nuclear reactor core, formed during a meltdown) that reminds us it is there occasionally with steam events and huge increases in radiation levels. Across the Pacific, we have at least two peer-reviewed scientific studies so far that have already provided evidence of increased mortality in North America, and thyroid problems in infants on the west coast states from our initial exposures. The operation to begin removing fuel from such a severely damaged pool has never been attempted before. The rods are unwieldy and very heavy, each one weighing two-thirds of a ton. But it has to be done, unless there is some way to encase the entire building in concrete with the pool as it is. I don’t know of anyone discussing that option, but it would seem much ‘safer’ than what they are about to attempt…but not without its own set of risks. And all this collateral damage will continue for decades, if not centuries, even if things stay exactly the way they are now. But that is unlikely, as bad things happen like natural disasters and deterioration with time…earthquakes, subsidence, and corrosion, to name a few. Every day that goes by, the statistical risk increases for this apocalyptic scenario. No one can say or know how this will play out, except that millions of people will probably die even if things stay exactly as they are, and billions could die if things get any worse. Just where would you put 40 million refugees? During the initial crisis there was talk that the entire population of Japan, approximately 128 million, might have to be permanently evacuated. Given that the situation might rapidly deteriorate that possibility still exists. So, where do you put 128 million refugees? More information and photos as here, here, and here. Bee nice to the bees. 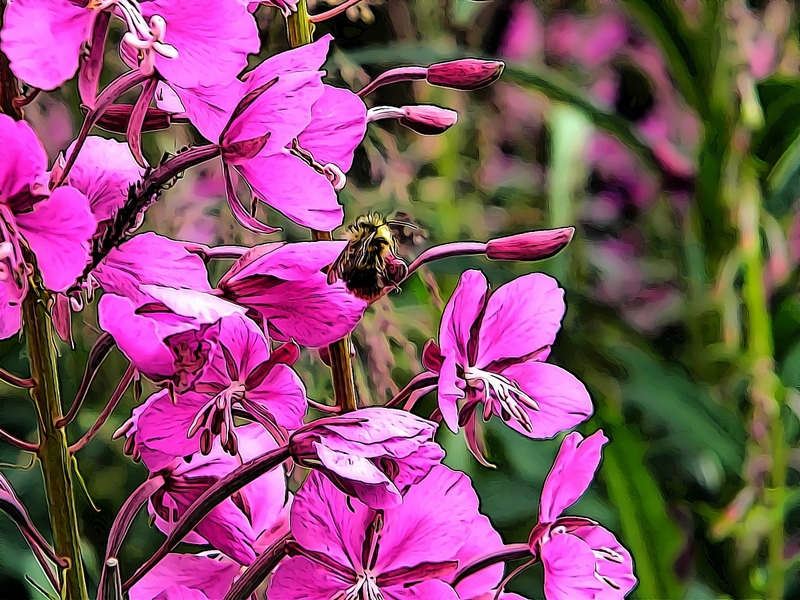 A bumblebee does its work on Fireweed in Alaska. Bees are the primary pollinators in ecosystems containing flowering plants. Bees and other insects pollinate 70 per cent of cultivated plants, accounting for 35 per cent of overall food production. Fewer bees means smaller harvests. Bees are in trouble; that means we are as well. There are nearly 20,000 known species of bees. They are found on every continent except Antarctica, in every habitat on the planet that contains insect-pollinated flowering plants. Bees feeding on nectar and pollen, the former primarily as an energy source; the latter primarily for protein and other nutrients. Most pollen is used as food for larvae. The best-known bee species is the European honey bee, which, as its name suggests, produces honey, as do a few other types of bee. Bees either focus on gathering nectar or on gathering pollen depending on demand, especially in social species. Bees gathering nectar may accomplish pollination, but bees that are deliberately gathering pollen are more efficient pollinators. It is estimated that one third of the human food supply depends on insect pollination, most of which is accomplished by bees, especially the domesticated European honey bee. Bees have a long proboscis (a complex “tongue”) that enables them to obtain the nectar from flowers. They have antennae almost universally made up of 13 segments in males and 12 in females. Bees all have two pairs of wings, the hind pair being the smaller of the two; in a very few species, one gender or caste has relatively short wings that make flight difficult or impossible, but none are wingless. Most bees are fuzzy and carry an electrostatic charge, which aids in the adherence of pollen. Female bees periodically stop foraging and groom themselves to pack the pollen into the scopa, which is on the legs in most bees, and on the ventral abdomen on others, and modified into specialized pollen baskets on the legs of honey bees and their relatives. Many bees are opportunistic foragers, and will gather pollen from a variety of plants, while others concentrate on only one or a few types of plant. A small number of plants produce nutritious floral oils rather than pollen, which are gathered and used by some bees. Visiting flowers can be a dangerous occupation. Many assassin bugs and crab spiders hide in flowers to capture unwary bees. Other bees are lost to birds in flight. Insecticides used on blooming plants kill many bees, both by direct poisoning and by contamination of their food supply. A honey bee queen may lay 2000 eggs per day during spring buildup, but she also must lay 1000 to 1500 eggs per day during the foraging season, mostly to replace daily casualties, most of which are workers dying of old age. Bees are in trouble; that means we are as well. The growth in the use of neonicotinoid pesticides has roughly tracked rising bee deaths since 2005. In 2012, several scientific studies showed that neonicotinoids had previously undetected routes of exposure affecting bees including through dust, pollen, and nectar; that very small amounts were sufficiently toxic to cause failure to return to the hive without immediate lethality, the primary symptom of CCD, and indicated environmental persistence of neonicotinoids in irrigation channels and soil. These studies prompted a formal 2013 peer review by the European Food Safety Authority that said neonicotinoids pose an unacceptably high risk to bees. CCD is probably compounded by a combination of factors. In 2007, some authorities attributed the problem to biotic factors such as Varroa mites, Nosema apis parasites, and Israel acute paralysis virus. Other contributing factors may include environmental change-related stress, malnutrition, and migratory beekeeping. Another study in 2012 also pointed to multiple causes, listing pesticides behind the varroa mite, genetics, habitat loss, and poor nutrition. Since about 1972 there has been a dramatic reduction in the number of feral honey bees in the US – they have largely disappeared. And the number of colonies maintained by beekeepers has also declined. This decline includes the cumulative losses from all factors, such as urbanization, pesticide use, tracheal and Varroa mites, and commercial beekeepers’ retiring and going out of business. However, in late 2006 and early 2007 the rate of attrition reached new proportions, and the term colony collapse disorder was coined to describe the sudden disappearances. After several years of research and concern, a team of scientists headed by Jerry Bromenshenk published a paper in October 2010 saying that a new DNA-based virus, invertebrate iridescent virus or IIV6, and the fungus Nosema ceranae were found in every killed colony the group studied. In their study they found that neither agent alone seemed deadly, but a combination of the virus and Nosema ceraneae was always 100% fatal. Bromenshenk said it is not yet clear whether one condition weakens the bees enough to be finished off by the second, or whether they somehow compound the other’s destructive power. “They’re co-factors, that’s all we can say at the moment. They’re both present in all these collapsed colonies.”Investigations into the phenomenon had occurred amidst great concern over the nature and extent of the losses. In 2009 some reports from the US suggested that 1/3 of the honey bee colonies did not survive the winter, though normal winter losses are known to be around 25%. At the end of May 2012, the Swiss government reported that about half of the bee population had not survived the winter. The main cause of the decline was thought to be the parasite varroa. Apart from colony collapse disorder, many of the losses outside the US have also been attributed to other causes. Pesticides used to treat seeds have been considered prime suspects. Native pollinators include bumblebees and solitary bees, which often survive in refuges in wild areas away from agricultural spraying, but may still be poisoned in massive spray programs for mosquitoes, gypsy moths, or other insect pests. Although pesticide use remains a concern, the major problem for wild pollinator populations is the loss of the flower-rich habitat on which they depend for food. Throughout the northern hemisphere, the last 70 or so years have seen an intensification of agricultural systems, which has decreased the abundance and diversity of wild flowers. You can help bees by planting bee-friendly flowers and shrubs in your garden or outside space. A garden or patch devoted to plants that are attractive to bees can be a source of great pleasure to any beekeeper, as much for the riot of color as for the activity of the bees. Two other important factors contribute to a successful bee garden: The flowers should be in full sunlight and should be planted in groups. Flowers grown singularly or in twos and threes may fail to attract bees. A decent-sized clump of a suitable plant, such as lavender, is much more valuable. Likewise, bees often overlook flowers grown in shade even though they may produce nectar and pollen. Unfortunately, some of the most spectacular-looking garden flowers are of no use whatsoever to the honeybee. Double-headed roses, chrysanthemums and dahlias, for example, provide no nectar and hardly any pollen. In contrast, many flowers that are often discounted as weeds, such as dandelions and forget-me-nots, provide a rich source of food. That is why one of the best and easiest things you can do to make your garden more bee-friendly is to throw away the weedkillers that maintain those immaculate-looking lawns and instead let your lawn and flower beds go wild. If you are not quite ready to hand over your well-tended garden to the vagaries of nature, the next best thing is to leave just a patch to run wild. One way to get your wild garden started is to sow wildflower seed mixtures. The flowers will be a useful source of nectar and pollen. Information drawn from multiple sources. The taiga during the short summer season. The taiga, covering a large art of the world, but little understood by most people, is threatened due to climate change. An image of the North American taiga (boreal forest) during the short summer period. The Taiga is a nearly continuous belt of coniferous trees across North America and Eurasia overlying formerly glaciated areas and areas of patchy permafrost. 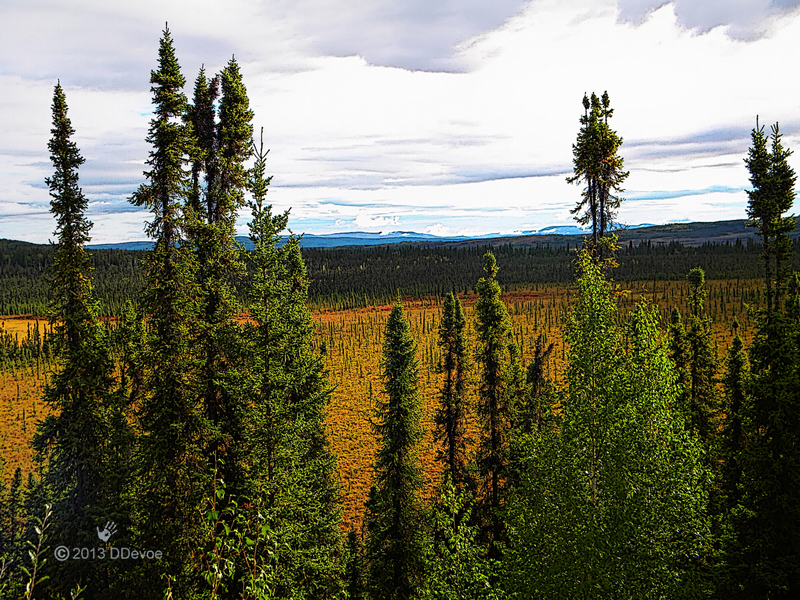 The term “boreal forest” is sometimes used to refer to the more southerly part of the biome, while taiga is used to describe more barren areas of the north approaching the tree line and the tundra biome. The term “boreal” is taken from Boreas, Greek god of the north wind. The taiga is the world’s largest terrestrial biome accounting for 29% of the world’s forest cover. It stretches over Eurasia and North America. Winters are very cold , summers are warm, rainy, and humid. In North America it covers most of inland Canada and Alaska as well as parts of the extreme northern continental United States (northern Minnesota through the Upper Peninsula of Michigan to Upstate New York and northern New England). It also covers most of Sweden, Finland, much of Norway, lowland/coastal areas of Iceland, much of Russia, northern Kazakhstan, northern Mongolia, and northern Japan. However, the predominant tree species varies. For example, the taiga of North America consists of mainly spruces; Scandinavian and Finnish taiga consists of a mix of spruce, pines and birch; Russian taiga has spruces, pines and larches depending on the region, the Eastern Siberian taiga being a vast larch forest. The growing season, when the vegetation in the taiga comes alive, is usually slightly longer than the climatic definition of summer as the plants of the boreal biome have a lower threshold to trigger growth. For the Taiga Plains in Canada, growing season varies from 80 to 150 days. Data for locations in southwest Yukon gives 80–120 frost-free days. High latitudes mean that the sun does not rise far above the horizon, and less solar energy is received than further south. But the high latitude also ensures very long summer days, as the sun stays above the horizon nearly 20 hours each day, with only around 6 hours of daylight occurring in the dark winters, depending on latitude. The areas of the taiga inside the Arctic circle have midnight sun in mid-summer and polar night in mid-winter. The taiga experiences relatively low precipitation throughout the year , primarily as rain during the summer months, but also as fog and snow. Snow may remain on the ground for as long as nine months in the northernmost extensions of the taiga. Muskeg (bogs) occur in poorly drained, glacial depressions. Sphagnum moss forms a spongy mat over ponded water. Growing on this mat are species of the tundra such as cottongrass and shrubs of the heath family. Black spruce and larch ring the edge. Taiga soil tends to be young and poor in nutrients. It lacks the deep, organically enriched profile present in temperate deciduous forests. The thinness of the soil is due largely to the cold, which hinders the development of soil and the ease with which plants can use its nutrients. Fallen leaves and moss can remain on the forest floor for extended periods in the cool, moist climate. Acids from evergreen needles further leach the soil. Acidic soil often limits flora diversity to little more than lichens and some mosses. Herbs and berries can be found in clearings and areas with a prevalence of deciduous trees. The boreal forest is home to many types of berries such as raspberry, cranberry, cloudberry), bilberry and lingonberry. Diversity of soil organisms in the boreal forest is high, comparable to the tropical rainforest. Since North America and Asia used to be connected by the Bering land bridge, a number of animal and plant species colonized both continents and are distributed throughout the taiga biome. Others differ regionally, typically with each genus having several distinct species, each occupying different regions of the taiga. Taigas also have some small-leaved deciduous trees like birch, alder, willow, and poplar; mostly in areas escaping the most extreme winter cold. Southernmost regions of the taiga may have trees such as oak, maple, elm, and tilia scattered among the conifers. – Taiga trees tend to have shallow roots to take advantage of the thin soils. – Many species of tree found there seasonally alter their biochemistry to make them more resistant to freezing, called “hardening”. – The conical or spire-shaped promotes shedding of snow and prevents loss of branches. – Needleleaf – narrowness reduces surface area through which water may be lost (transpired), especially during winter when the frozen ground prevents plants from replenishing their water supply and dessication could become problematic. 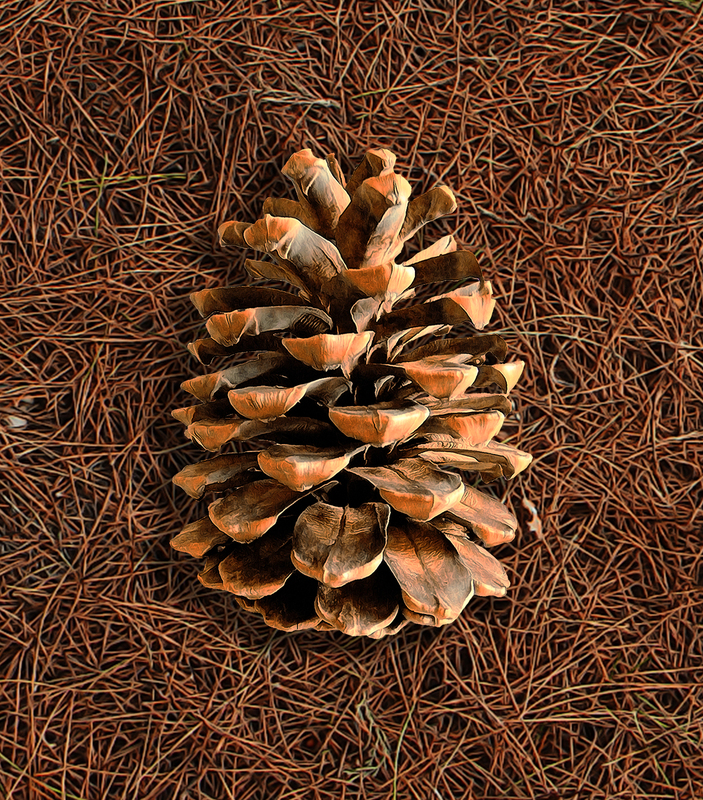 The needles of boreal conifers also have thick waxy coatings–a waterproof cuticle–in which stomata are sunken and protected from drying winds. – Evergreen habit – retention of foliage allows the trees photosynthesize with their older leaves in late winter and spring when light is good but temperatures are still too low for new growth. Larch are dominant in areas underlain by nearly continuous permafrost and having a climate even too dry and cold for the waxy needles of spruce and fir. Dark needles promotes maximum heat absorption allowing for photosynthesis at temperatures lower than would otherwise be the case. A wide variety of wildlife are found in the taiga. Insects play a critical role as pollinators, decomposers, and as a part of the food web. Many nesting birds rely on them for food especially in the months of February and March. The cold winters and short summers make the taiga a challenging biome for reptiles and amphibians, which depend on environmental conditions to regulate their body temperatures, and there are only a few species in the boreal forest including red-sided garter snake, common European adder, blue-spotted salamander, northern two-lined salamander, Siberian salamander, wood frog, northern leopard frog, boreal chorus frog, American toad, and Canadian toad. Most hibernate underground in winter. Fish of the taiga must be able to withstand cold water conditions and be able to adapt to life under ice covered water. Species in the taiga include Alaska blackfish, northern pike, walleye, longnose sucker, white sucker, various species of cisco, lake whitefish, round whitefish, pygmy whitefish, arctic lamprey, various grayling species, brook trout (including sea-run brook trout in the Hudson bay area), chum salmon, Siberian taimen, lenok and lake chub. The taiga is home to a number of large herbivorous mammals, such as moose and reindeer/caribou. Some areas have populations of other deer species such as the elk (wapiti) and roe deer.The largest animal in the taiga is the wood bison, found in northern Canada, Alaska and has been newly introduced into the Russian far-east. There is also a range of rodent species including beaver, squirrel, mountain hare, snowshoe hare, North American porcupine and vole. These species have adapted to survive the harsh winters in their native ranges. Some larger mammals, such as bears, eat heartily during the summer in order to gain weight, and then go into hibernation during the winter. Other animals have adapted layers of fur or feathers to insulate them from the cold. Predatory mammals of the taiga must be adapted to travel long distances in search of scattered prey or be able to supplement their diet with vegetation or other forms of food (such as raccoons). Mammalian predators of the taiga include Canada lynx, Eurasian lynx, stoat, Siberian weasel, least weasel, sable, American marten, North American river otter, European otter, American mink, wolverine, Asian badger, fisher, gray wolf, coyote, red fox, brown bear, American black bear, Asiatic black bear, polar bear and Siberian tiger. Large areas of Siberia’s taiga have been harvested for lumber since the collapse of the Soviet Union. In some cases, after clearcutting of trees, topsoil was also removed for shipment to Japan. In Canada, eight percent of the taiga is protected from development. The main forestry practice in the boreal forest of Canada is clearcutting, which involves cutting down most of the trees in a given area, then replanting the forest as a monocrop (one species of tree) the following season. Industry officials claim that this process emulates the natural effects of a forest fire, which they claim clearcutting suppresses, protecting infrastructure, communities and roads. 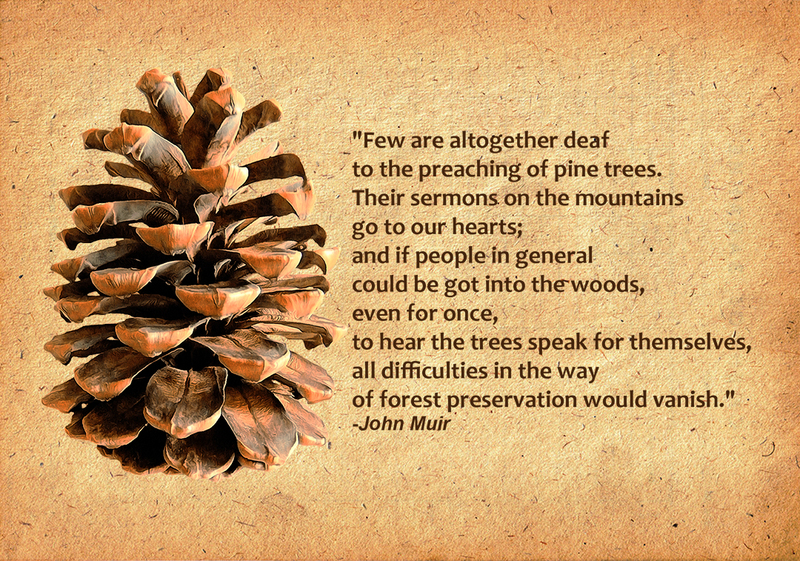 However, from an ecological perspective, this is a falsehood, for several reasons, including: a) Removing most of the trees in a given area is usually done using large machines which disrupt the soil greatly, and the dramatic diminution of ground cover permits large-scale erosion and avalanches, which further damage the habitat and sometimes endangers infrastructure, roads, and communities. b) Clearcutting removes most of the biomass from an area, and the various macro and micro-nutrients it contains. This sudden decrease in nutrients in an area contrasts with a forest fire, which returns most of the nutrients to the soil. c) Forest fires leave standing snags, and leave patches of unburned trees. This helps preserve structure and micro-habitats within the area, whereas clearcutting destroys most of these habitats. In the past, clearcuts upwards of 110 km² have been recorded in the Canadian boreal forest. However, today 80% of clearcuts are less than 260 hectares(2.6 square km). Some of the products from logged boreal forests include toilet paper, copy paper, newsprint, and lumber. More than 90% of boreal forest products from Canada are exported for consumption and processing in the United States. However with the recession and fewer US homes being built, that has changed. Some of the larger cities situated in this biome are Murmansk, Arkhangelsk, Yakutsk, Anchorage, Yellowknife, Tromsø, Luleå, and Oulu. The zone of latitude occupied by the boreal forest has experienced some of the greatest temperature increases on Earth, especially during the last quarter of the twentieth century. Winter temperatures have increased more than summer temperatures. The number of days with extremely cold temperatures (e.g., −20 to −40 °C) has decreased irregularly but systematically in nearly all the boreal region, allowing better survival for tree-damaging insects. In summer, the daily low temperature has increased more than the daily high temperature. In Fairbanks, Alaska, the length of the frost-free season has increased from 60–90 days in the early twentieth century to about 120 days a century later. Summer warming has been shown to increase water stress and reduce tree growth in dry areas of the southern boreal forest in central Alaska, western Canada and portions of far eastern Russia. Precipitation is relatively abundant in Scandinavia, Finland, northwest Russia and eastern Canada, where a longer growth season (i.e. the period when sap flow is not impeded by frozen water) accelerate tree growth. As a consequence of this warming trend, the warmer parts of the boreal forests are susceptible to replacement by grassland, parkland or temperate forest. In Siberia, the taiga is converting from predominantly needle-shedding larch trees to evergreen conifers in response to a warming climate. This is likely to further accelerate warming, as the evergreen trees will absorb more of the sun’s rays. Given the vast size of the area, such a change has the potential to affect areas well outside of the region. In much of the boreal forest in Alaska, the growth of white spruce trees are stunted by unusually warm summers, while trees on some of the coldest fringes of the forest are experiencing faster growth than previously. Many nations are taking direct steps to protect the ecology of the taiga by prohibiting logging, mining, oil and gas production, and other forms of development. In February 2010 the Canadian government established protection for 13,000 square kilometres of boreal forest by creating a new 10,700 square kilometre park reserve in the Mealy Mountains area of eastern Canada and a 3,000 square kilometre waterway provincial park that follows alongside the Eagle River from headwaters to sea. Two Canadian provincial governments, Ontario and Quebec, introduced measures in 2008 that would protect at least half of their northern boreal forest. Although both provinces admitted it will take years to plan, work with Aboriginal and local communities and ultimately map out precise boundaries of the areas off-limits to development, the measures are expected to create some of the largest protected areas networks in the world once completed. The taiga stores enormous quantities of carbon, more than the world’s temperate and tropical forests combined, much of it in wetlands and peatland. In fact, current estimates place boreal forests as storing twice as much carbon per unit area as tropical forests.